In April I finished one of the most extensive illustration jobs I’ve done so far, the book Piga, klockare, inhysing, lots, by the author Carina Wolff-Brandt (book in Swedish, published by Vingpennan). It finally arrived from the printers’ in the beginning of July and is now for sale! The book is part historical fiction, part fact, about the life of people in the archipelago of Southern Finland during the years 1669-1809. I begun work on the illustrations in August 2017, and by the end of April the amount of images landed at around 70. They are all graphite drawings, and then digitally assembled and colored. The original drawings are for sale, so if you happen to read the book and wonder about some of the drawings you can ask me about them by sending an e-mail (jennykwiik@gmail.com) or sending a DM on one of my social media accounts (Instagram @kiiwyn for example). Some of them are already sold, so act fast if you’re interested! I feel very proud to have been part of the team making this book. The text is fantastic, a very engaging mix of fiction and fact, that paints a vivid image of the people of the archipelago. My task was to imagine places, people and object that are in some cases not pictured anywhere. For example a coast line in the 17th century will look very different. This was a very cool challenge, and I’ve been waiting for an opportunity to work with historical illustration. I really hope I will have the chance to do it again! In the book there are also animals and plants, and this has also been a dream of mine, to have the chance to work with images of flora and fauna. A fantasy I have is to get the opportunity to illustrate a book on botany or similar. The graphic design is also stunning! Made by Tuire Aho (Anno Design Oy). Anyway. Cheers to our new book! I’ve received tons of wonderful feedback, and all I want is that as many people as possible see and read this beautiful book. That is a quote by Rosa Luxemburg, and since I saw it last year I have been thinking it is very descriptive of my attitude towards life. I move on and I need to be free. I also keep creating new things. It’s time for a blog update, enjoy because they don’t come very often, haha! Last Spring I finished work on the Literature game I was working on with a writer and a programmer, and a larger team of experts and support organizations. The game itself will be launched next month, so I will write more about it later. I have been using this experience of co-creating a serious game for my Master’s thesis in Service Design, that I hope to complete this Autumn. The thesis writing got delayed because I simply had too much work and big changes in my personal life in the Spring to focus on it. But now it is moving onward. I also have a new studio and work space from July onwards. It feels amazing to have a large room all to myself.. white walls to fill with ideas and works in progress. But the funny thing is that I currently mostly work digitally, so I still sit cooped up in one corner of the room with my laptop. I hope I can take time to paint more at some point and really use the space that I have now. Meanwhile I am also doing the layout of another easy to read adaptation of the Moomin books, and drawing simple illustrations for a web based language learning material. And as always some exciting and very secret projects are bubbling under and moving along in their own pace in my mind and together with some awesome people (usually it’s writers). What I have noticed over the years is that what I really love about illustration is that it is collaborative. I get inspired by others, by meeting new people, and forming new work partnerships. They shape me and push me into new directions, and I hope they feel the same excitement I do when we work towards creating something new together. So. Moving forward with renewed energy and passion for my work. Last summer I worked on illustrations for one of my personal projects – an art game/visual novel-kind of thing. It has been on a break the whole of autumn, but I took some time now to finish up 10 of the images. The project is still very open and developing organically. I’m not sure what the end result is going to be, but I want the story to be a branching narrative, where the reader can choose between different paths. But I think I at least have the visual style ready. For now, the project will take a rest again, and I will see when I have more time to develop it further (since I have some very exciting other projects this Spring to focus on). The next task would be to finish the script completely. And I noticed that while making the illustrations, I felt a need to change the story too. So the two elements of text and visuals are going to develop together. It is time for a summer update, before I take a small Midsummer break from work (and I mean small, just a few days; I don’t have time or need for a longer vacation this year – my passion for my work and business burning a hole in my belly). From March to the beginning of June I worked mostly with a group of special education children in an afternoon club. This was a new experience for me, and I learned very much about myself and about what children like this need. And of course, getting to know these wonderful kids was a huge privilege. I will miss them. A lot of the observations I made will be very useful when I continue working with serious games. So, serious games, that is my focus from June and onwards. I have started working on a Literature game with a team of teachers and educators. I also got some experience in recruiting, as I was able to find and lure in the perfect candidate for the technical implementation of the game. The plan is to go with pixel art on this one, and I am looking forwards to creating the graphics and visual feel of this fun project. It will continue on in the Autumn, and the goal is to present a demo in January. I am also focusing on my own art game, that I received a grant for in March. The image in this post is one of the first background images for this game. The game starts with a stormy ocean… a very symbolic image for me personally. It also represents my emotional life this year. This is something I aim to truly live up to: my art and work living in symbiosis with experiences and emotions in my private life and in the way I experience world events. The working title for the art game is “My Little Light”, and it is about survival on a symbolic level. But the background for the story lies in the harsh reality of the political situation in Europe today – the humanitarian crisis that is unfolding, and that is so disastrously and shamefully dealt with in my part of the world. I will present the project more in depth in August, when I plan to have a demo ready. But I am hoping I will be able to publish the game in many languages, when it is time – English, Swedish, Finnish and Arabic. I am quite nervous about developing this game, because of the political undertones, but I will just have to trust myself and go ahead and do the best I can. I am also writing on my Master’s thesis in Leadership and Service Design, now with a focus on the three serious game projects I am working on, touching on the areas of art, learning and health. My hope is also to say something about the future of the industry, and of course, securing a place in the industry for myself. I am also still doing graphic design for books, one project is very soon finished. I am now doing the last rounds of corrections in the script. Hopefully I will get more book design projects in the future also, as it is very rewarding work. I’ve been a busy little bee, the last couple of months. Juggling a staggering amount of projects and searching for new ones at the same time, is time consuming and not very easy at all. But things are looking up, and the future looks bright! On the studies side, I’ve completed 15 ETCS in Service Design courses last autumn, and now I’m in the middle of a course called Marketing Skills. I’m mostly focusing on developing my company brand in the course project. Very fun and interesting work! Later in the Spring I will attend a class on Future Research – and area that has interested me for a long time. I’ve started writing my Master’s thesis for my degree programme, and my working topic is “Drawing the Future of Illustration”. In the thesis I will focus on my own artist brand, where I want to develop it, and how I see the future of my business. My work illustrating an easy to read adaption of the prize winning fantasy novel Maresi by Maria Turtschaninoff has been very fun and challenging. I am also doing the graphic design, basically the whole visual layout of the book. I would say I am a bit over halfway done with it now, and the work is due to be finished for printing in June. It will be published by Lärum Förlag in August 2016. The Speech Therapy Application demo that I’m doing script and graphics for, is soon finished – it is final crunch time at the moment. It will be showcased in the ICT-showroom in March. This work has been an absolute joy, especially the collaboration with the wonderful team! The app and game has raised a lot of interest, which is expected: the idea to make fun games for kids to play, while doing speech therapy is brilliant. There will also be development of technical innovations in the app. I’m very happy to be part of the project, and am hoping to be able to keep developing the app with our awesome team! And Underworld Kitchen is also under active development again. I’m doing ten more characters, and once again I get to tinker with pixels, and I LOVE IT! I’ll also be doing some environment concepts for the game. I’ve been teaching comic book drawing on Thursday evenings, and I’m really enjoying coming up with new exercises and experimenting on the students… I’ve been teaching academic subjects for many years, but now I really think I’ve found what I really should be doing when it comes to education. Teaching a more practical subject, like drawing and comics, is just so much fun! And I feel I can really develop as a leader, facilitator and interaction designer at the same time. Exciting times. The light is returning in the North and life goes on. In my last blog post I said I have more good news. And I sure do! I got a grant from The Finnish Association for Illustrators, that I’ve been a member of for eight years already. I haven’t applied for their working grants before, and in April I got the idea that my Goldilocks illustration could use some company. I already had a contact to a publisher who publishes easy to read books for all ages, and so I pitched them a story book with my illustrations. The fairy tales I’ve picked out will all have a girl protagonists. However, another author who knows more about easy to read texts will do the writing. So in September and onwards I’ll be focusing on fairy tales! I’m so excited about this, it’s a dream come true. 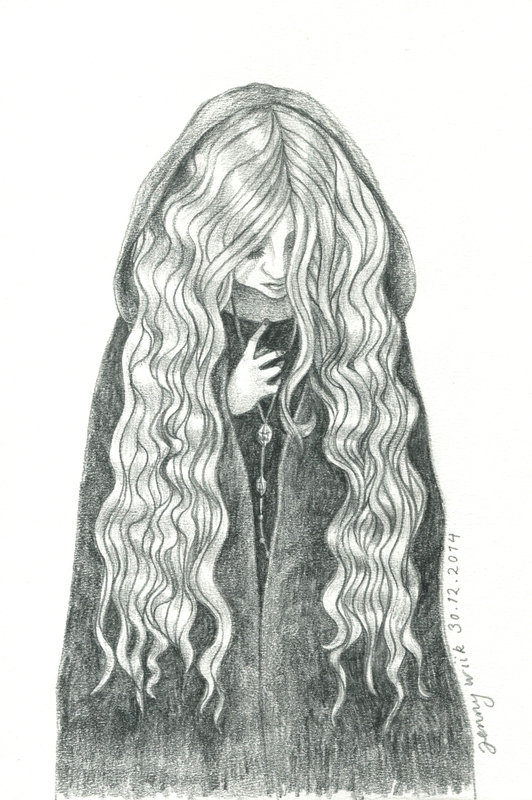 Ever since I was young I’ve adored classical fairy tale illustration, especially artists from the Nordic countries: John Bauer, Hans Arnold, Theodor Kittelsen, Rudolf Koivu, Kay Nielsen, Björn Landström and Tove Jansson of course. Now I will have a chance to make my own mark among these giants. 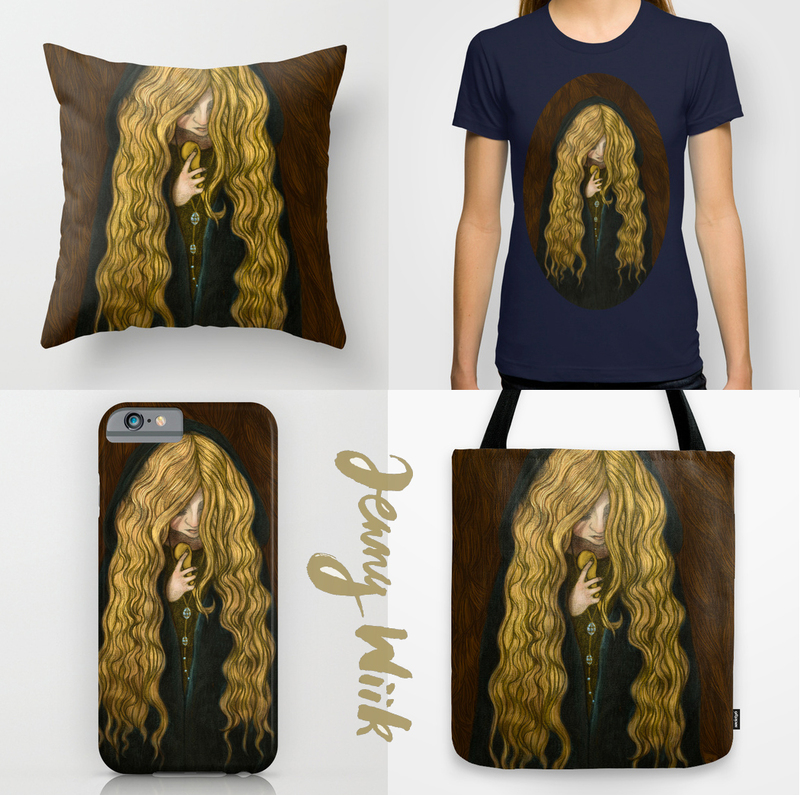 Goldilocks is already available as a print: Check my Society6-shop! I’m still on maternity leave until the end of February, but I’ve done some projects during January. First there’s Daleks for Doctors. The idea came from a facebook-group I’m in, Geek Women Workout. 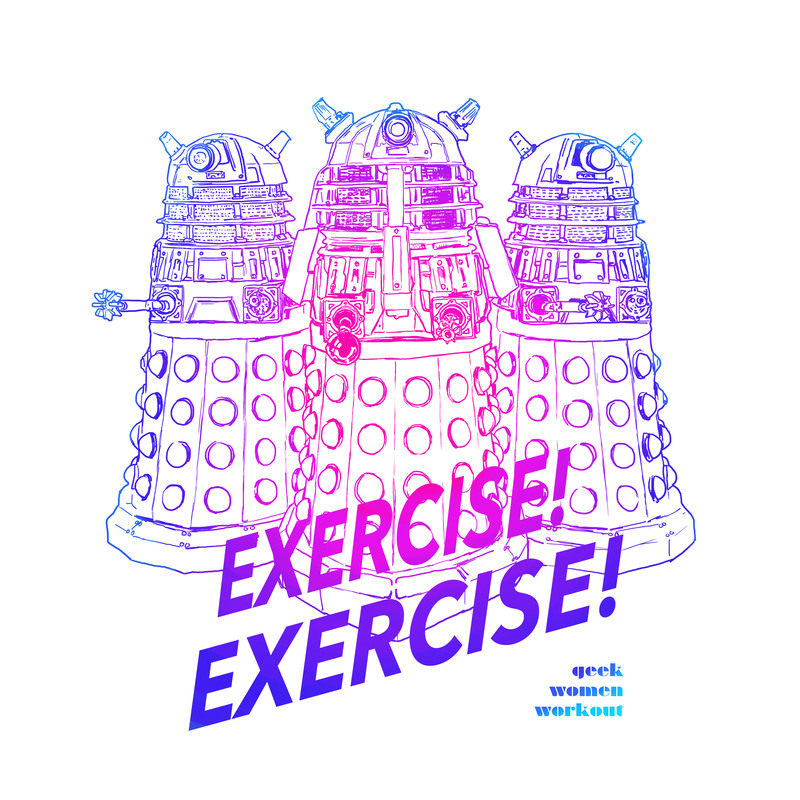 A member wanted a T-shirt with Daleks saying “Exercise! Exercise!”, so I decided I needed to make those tees happen. All profits will go to Doctors without borders, as the idea was not mine, and I’ve been waiting for the chance to do a charity project. And the print is available in my Society6-shop! Chop chop and go shopping! Very chilly wind at the beach. So just a quick visit.